Android now offers the new RecyclerView widget, a new and improved view group for displaying collections. 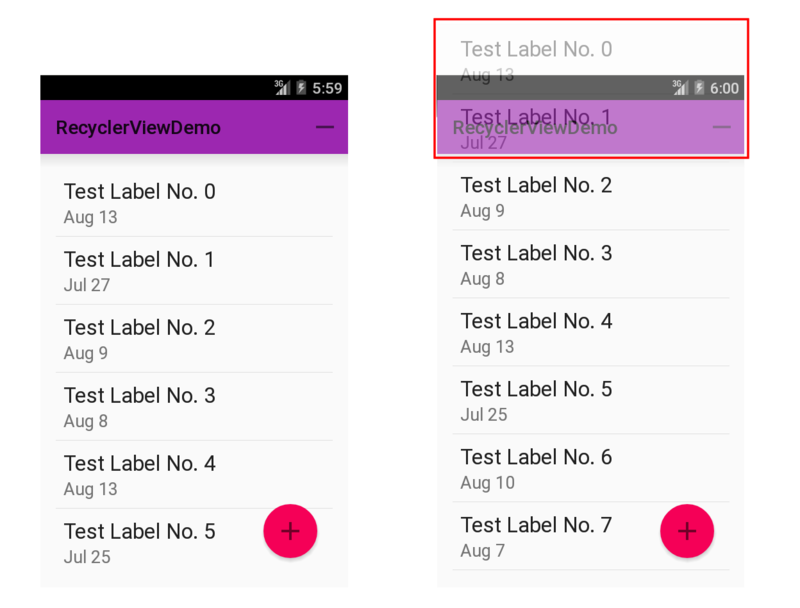 This guide explains how to use and customize RecyclerView in Xamarin.Android applications. It has a flexible architecture that lets you modify its behavior by plugging in your preferred components. It is efficient with large collections because it reuses item views and requires the use of view holders to cache view references. This guide explains how to use RecyclerView in Xamarin.Android applications; it explains how to add the RecyclerView package to your Xamarin.Android project, and it describes how RecyclerView functions in a typical application. Real code examples are provided to show you how to integrate RecyclerView into your application, how to implement item-view click, and how to refresh RecyclerView when its underlying data changes. This guide assumes that you are familiar with Xamarin.Android development. Xamarin.Android – Xamarin.Android 4.20 or later must be installed and configured with either Visual Studio or Xamarin Studio. If you are using Xamarin Studio, version 5.5.4 or later is required. Your app project must include theXamarin.Android.Support.v7.RecyclerView package. For more information about installing NuGet packages, see Walkthrough: Including a NuGet in your project. RecyclerView is slightly more complex to use: you have to write more code to use RecyclerView compared to ListView. RecyclerView does not provide a predefined adapter; you must implement the adapter code that accesses your data source. 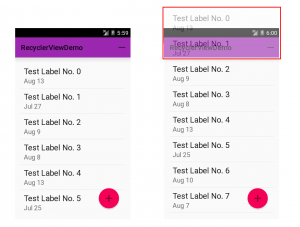 However, Android includes several predefined adapters that work with ListViewand GridView. RecyclerView does not offer an item-click event when a user taps an item; instead, item-click events are handled by helper classes. By contrast, ListView offers an item-click event. RecyclerView enhances performance by recycling views and by enforcing the view-holder pattern, which eliminates unnecessary layout resource lookups. Use of the view-holder pattern is optional in ListView. RecyclerView is based on a modular design that makes it easier to customize. For example, you can plug in a different layout policy without significant code changes to your app. By contrast, ListView is relatively monolithic in structure. RecyclerView includes built-in animations for item add and remove.ListView animations require some additional effort on the part of the app developer. This app uses CardView to implement each photograph item in theRecyclerView layout. Because of RecyclerView‘s performance advantages, this sample app is able to quickly scroll through a large collection of photos smoothly and without noticeable delays. Adapter – Inflates item layouts (instantiates the contents of a layout file) and binds data to views that are displayed within a RecyclerView. The adapter also reports item-click events. LayoutManager – Measures and positions item views within aRecyclerView and manages the policy for view recycling. ViewHolder – Looks up and stores view references. The view holder also helps with detecting item-view clicks. ItemDecoration – Allows your app to add special drawing and layout offsets to specific views for drawing dividers between items, highlights, and visual grouping boundaries. ItemAnimator – Defines the animations that take place during item actions or as changes are made to the adapter. The relationship between the RecyclerView, LayoutManager, and Adapterclasses is depicted in the following diagram. As this figure illustrates, the LayoutManager can be thought of as the intermediary between the Adapter and the RecyclerView. The LayoutManagermakes calls into Adapter methods on behalf of the RecyclerView. For example, the LayoutManager calls an Adapter method when it is time to create a new view for a particular item position in the RecyclerView. TheAdapter inflates the layout for that item and creates a ViewHolder instance (not shown) to cache references to the views at that position. When theLayoutManager calls the Adapter to bind a particular item to the data set, theAdapter locates the data for that item, retrieves it from the data set, and copies it to the associated item view. RecyclerView.Adapter – Provides a binding from your app’s data set (which is specific to your app) to item views that are displayed within the RecyclerView. The adapter knows how to associate each item-view position in the RecyclerView to a specific location in the data source. In addition, the adapter handles the layout of the contents within each individual item view and creates the view holder for each view. The adapter also reports item-click events that are detected by the item view. RecyclerView.ViewHolder – Caches references to the views in your item layout file so that resource lookups are not repeated unnecessarily. The view holder also arranges for item-click events to be forwarded to the adapter when a user taps the view-holder’s associated item view. RecyclerView.LayoutManager – Positions items within the RecyclerView. You can use one of several predefined layout managers or you can implement your own custom layout manager. RecyclerView delegates the layout policy to the layout manager, so you can plug in a different layout manager without having to make significant changes to your app. If you do not extend ItemDecoration and ItemAnimator, RecyclerView uses default implementations. This guide does not explain how to create customItemDecoration and ItemAnimator classes; for more information about these classes, see RecyclerView.ItemDecoration and RecyclerView.ItemAnimator. When a view scrolls out of sight and is no longer displayed, it becomes a scrap view. The scrap view is placed in a pool and becomes a recycle view. This pool is a cache of views that display the same type of data. When a new item is to be displayed, a view is taken from the recycle pool for reuse. Because this view must be re-bound by the adapter before being displayed, it is called a dirty view. The dirty view is recycled: the adapter locates the data for the next item to be displayed and copies this data to the views for this item. References for these views are retrieved from the view holder associated with the recycled view. The recycled view is added to the list of items in the RecyclerView that are about to go on-screen. The recycled view goes on-screen as the user scrolls the RecyclerViewto the next item in the list. Meanwhile, another view scrolls out of sight and is recycled according to the above steps. In addition to item-view reuse, RecyclerView also uses another efficiency optimization: view holders. A view holder is a simple class that caches view references. Each time the adapter inflates an item-layout file, it also creates a corresponding view holder. The view holder uses FindViewById to get references to the views inside the inflated item-layout file. These references are used to load new data into the views every time the layout is recycled to show new data. In the following code examples, we’ll look at the implementation of theRecyclerViewer sample app to understand how RecyclerView works in a real application. We’ll examine the adapter and view holder implementations to see how they support RecyclerView. In addition, we’ll see how to specify the layout manager, and we’ll modify the app to use a different layout manager. Because the implementation details of PhotoAlbum are not relevant to understanding RecyclerView, the PhotoAlbum source code is not presented here. The source code to PhotoAlbum is available in the file PhotoAlbum.cs in the RecyclerViewer sample app. This code instantiates the PhotoAlbum data source and passes it to our adapter, PhotoAlbumAdapter (which is defined later in this guide). Note that it is considered a best practice to pass the data source as a parameter to the constructor of the adapter. To plug our adapter into the RecyclerViewinstance, we call the RecyclerView SetAdapter method as shown above. The layout manager is responsible for positioning items in the RecyclerViewdisplay; it determines the presentation type (a list or a grid), the orientation (whether items are displayed vertically or horizontally), and which direction items should be displayed (in normal order or in reverse order). The layout manager is also responsible for calculating the size and position of each item in the RecycleView display. The layout manager has an additional purpose: it determines the policy for when to recycle item views that are no longer visible to the user. Because the layout manager is aware of which views are visible (and which are not), it is in the best position to decide when a view can be recycled. To recycle a view, the layout manager typically makes calls to the adapter to replace the contents of a recycled view with different data, as described previously inHow View Recycling Works. LinearLayoutManager – Arranges items in a column that can be scrolled vertically, or in a row that can be scrolled horizontally. GridLayoutManager – Displays items in a grid. StaggeredGridLayoutManager – Displays items in a staggered grid, where some items have different heights and widths. This code resides in the main activity’s OnCreate method. The constructor to the layout manager requires a context; typically, you supply the entireMainActivity by passing this as shown. In the example photo-viewing app, the predefind LinearLayoutManager is used to lay out each CardView in a vertical scrolling arrangement. Alternatively, we could plug in a custom layout manager that displays twoCardView items side-by-side, implementing a page-turning animation effect to traverse through the collection of photos. Later in this guide, we’ll provide an example of how to modify the layout by swapping in a different layout manager. For more information about the layout manager, see theRecyclerView.LayoutManager class reference. Implement a constructor that looks up and stores the view references. Implement properties that the adapter can use to access these references. In this code example, the PhotoViewHolder constructor is passed a reference to the parent item view (the CardView) that PhotoViewHolder wraps. Note that we always forward the parent item view to the base constructor. ThePhotoViewHolder constructor calls FindViewById on the parent item view to locate each of its child view references, ImageView and TextView, storing the results in the Image and Caption properties, respectively. The adapter later retrieves view references from these properties when it updates thisCardView‘s child views with new data. For more information about RecyclerView.ViewHolder, see theRecyclerView.ViewHolder class reference. Most of the “heavy-lifting” of our RecyclerView integration code takes place in the adapter. RecyclerView requires that we provide an adapter derived from RecyclerView.Adapter to access our data source and populate each item with content from the data source. Because the data source is app-specific, we must implement adapter functionality that understands how to access our data. The adapter extracts information from the data source and loads it into each item in the RecyclerView collection. In the example photo-viewing app, the adapter loads each RecyclerViewrow with data for a particular photograph. For a given photograph at row position P, for example, the adapter locates the associated data at position Pwithin the data source and copies this data to the row item at position P in the RecyclerView collection. The adapter uses the view holder to lookup the references for the ImageView and TextView at that position so it doesn’t have to repeatedly call FindViewById for those views as the user scrolls through the photograph collection and reuses views. OnCreateViewHolder – Instantiates the item layout file and view holder. OnBindViewHolder – Loads the data at the specified position into the views whose references are stored in the given view holder. ItemCount – Returns the number of items in the data source. The layout manager calls these methods while it is positioning items within the RecyclerView. In the next few sections, we’ll look at the actual implementation of these methods in the example photo-viewing app. The layout manager calls OnCreateViewHolder when the RecyclerView needs a new view holder to represent an item. OnCreateViewHolder inflates the item view from the view’s layout file and wraps the view in a newPhotoViewHolder instance. The PhotoViewHolder constructor locates and stores references to child views in the layout as described previously in The View Holder. View itemView = LayoutInflater.From (parent.Context). The resulting view holder instance, vh, is returned back to the caller (the layout manager). The passed-in view holder object must first be cast into the derived view holder type (in this case, PhotoViewHolder) before it is used. The adapter loads the image resource into the view referenced by the view holder’sImage property, and it copies the caption text into the view referenced by the view holder’s Caption property. This binds the associated view with its data. Notice that OnBindViewHolder is the code that deals directly with the structure of the data. In this case, OnBindViewHolder understands how to map the RecyclerView item position to its associated data item in the data source. The mapping is trivial in this case because the position can be used as an array index into the photo album; however, more complex data sources may require extra code to establish such a mapping. For more information about RecyclerView.Adapter, see theRecyclerView.Adapter class reference. This basic app does not respond to item-touch events, nor does it handle changes in the underlying data. Later in this guide, we’ll add this functionality to the sample app. By changing only one line of code, we were able to modify the photo-viewing app to use a different layout with different behavior. Notice that neither the adapter code nor the layout XML had to be modified in order to change the layout policy. The basic example described in the previous sections actually doesn’t do much – it simply scrolls and displays a fixed list of photograph items. In real-world applications, users expect to be able to interact with the app by tapping on items in the display. Also, the underlying data source often changes (or is changed by the app), and the contents of the display must be consistent with these changes. In the following sections, we’ll learn how to handle item-click events and update RecyclerView when the underlying data source changes. When a user touches an item in the RecyclerView, an item-click event is generated to notify our app as to which item was touched. This event is not generated by RecyclerView – instead, the item view (which is wrapped in the view holder) detects touches and reports these touches as click events. The photograph’s CardView detects the item-click event and notifies the adapter. The adapter forwards the event (with item position information) to the activity’s item-click handler. The activity’s item-click handler responds to the item-click event. This example demonstrates just one approach for implementing event handlers with RecyclerView. Another approach that could be used here is to place events on the view holder and have the adapter subscribe to these events. If the sample photo app provided a photo editing capability, separate events would be required for the ImageView and the TextViewwithin each CardView: touches on the TextView would launch an EditViewdialog that lets the user edit the caption, and touches on the ImageViewwould launch a photo touchup tool that lets the user crop or rotate the photo. Depending on the needs of your app, you must design the best approach for handling and responding to touch events. NotifyItemChanged – Signals that the item at the specified position has changed. NotifyItemRangeChanged – Signals that the items in the specified range of positions have changed. NotifyItemInserted – Signals that the item in the specified position has been newly inserted. NotifyItemRangeInserted – Signals that the items in the specified range of positions have been newly inserted. NotifyItemRemoved – Signals that the item in the specified position has been removed. NotifyItemRangeRemoved – Signals that the items in the specified range of positions have been removed. NotifyDataSetChanged – Signals that the data set has changed (forces a full update). If you know exactly how your data set has changed, you can call the appropriate methods above to refresh RecyclerView in the most efficient manner. If you do not know exactly how your data set has changed, you can call NotifyDataSetChanged, which is far less efficient because RecyclerViewmust refresh all the views that are visible to the user. For more information about these methods, see RecyclerView.Adapter. This handler calls the photo album’s RandomSwap method when the Random Pick button is tapped. The RandomSwap method randomly swaps a photo with the first photo in the data source, then returns the index of the randomly-swapped photo. When we compile and run the sample app with this code, tapping the Random Pick button does not result in a display change because the RecyclerView is not aware of the change to the data source. Of course, we could call NotifyDataSetChanged instead of making the two calls to NotifyItemChanged, but doing so would force RecyclerView to refresh the entire collection even though only two items in the collection had changed. Calling NotifyItemChanged is significantly more efficient than calling NotifyDataSetChanged. This guide introduced the Android RecyclerView widget; it explained how to add the RecyclerView support library to Xamarin.Android projects, howRecyclerView recycles views, how it enforces the view-holder pattern for efficiency, and how the various helper classes that make up RecyclerViewcollaborate to display collections. It provided example code to demonstrate how RecyclerView is integrated into an application, it demonstrated how to tailor RecyclerView‘s layout policy by plugging in different layout managers, and it explained how to handle item click events and notify RecyclerView of data source changes. For more information about RecyclerView, see the RecyclerView class reference. In order to implement 2, ListView uses the view recycler to keep adding recycled views below or above the current viewport and moving active views to a recyclable pool as they move off-screencode while scrolling. This wayListView only needs to keep enough views in memory to fill its allocated space in the layout and some additional recyclable views—even when your adapter has hundreds of items. It will fill the space with rows in different ways—from top, from bottom, etc—depending on how the viewport changedcode. The image below visually summarizes what happens when you pan a ListViewdown. With this framework in mind, let’s move on to the tips. As you’ve seen above,ListView dynamically inflates and recycles tons of views when scrolling so it’s key to make your adapter’s getView() as lightweight as possible. All tips resolve around making getView() faster in one way or another. Every time ListView needs to show a new row on screen, it will call thegetView() method from its adapter. As you know, getView() takes three arguments arguments: the row position, a convertView, and the parentViewGroup. Finding an inner view inside an inflated layout is among the most common operations in Android. This is usually done through a View method calledfindViewById(). This method will recursively go through the view tree looking for a child with a given IDcode. Using findViewById() on static UI layouts is totally fine but, as you’ve seen, ListView calls the adapter’s getView() very frequently when scrolling. findViewById() might perceivably hit scrolling performance in ListViews—especially if your row layout is non-trivial. What you want to do is running all per-row IO or any heavy CPU-bound routine asynchronously in a separate thread. The trick here is to do that and still comply with ListView‘s recycling behaviour. For instance, if you run anAsyncTask to load a profile picture in the adapter’s getView(), the view you’re loading the image for might be recycled for another position before theAsyncTask finishes. So, you need a mechanism to know if the view hasn’t been recycled once you’re done with the async operation. At this year’s Google I/O, Google released a preview to the upcoming Android version. The so called L Developer Preview. This is a very big improvement over previous releases and I really love that Google is doing this. I think we all benefit by this decision. As developers and as consumers alike! Part of this preview are two new views: RecyclerView and CardView. This post gives you an introduction to the RecyclerView, it’s many internal classes and interfaces, how they interact and how you can use them. What’s with this odd name? Why RecyclerView? So RecyclerView is the appropriate view to use when you have multiple items of the same type and it’s very likely that your user’s device cannot present all of those items at once. Possible examples are contacts, customers, audio files and so on. The user has to scroll up and down to see more items and that’s when the recycling and reuse comes into play. As soon as a user scrolls a currently visible item out of view, this item’s view can be recycled and reused whenever a new item comes into view. Recycling of views is a very useful approach. It saves CPU resources in that you do not have to inflate new views all the time and it saves memory in that it doesn’t keep plenty of invisible views around. Now, you might say: That’s nothing new. And you’re right! We had that with ListView for a very long time. The concept of recycling views itself it not new. But while you previously had a ListView where the appearance, recycling and everything was tightly coupled, Google now follows a much better, a much more flexible approach with the new RecyclerView. I really like the approach Google has taken here! Here’s the thing: While with Listview we had tight coupling, Google now uses an approach where theRecyclerView itself doesn’t care about visuals at all. It doesn’t care about placing the elements at the right place, it doesn’t care about separating any items and not about the look of each individual item either. To exaggerate a bit: All RecyclerView does, is recycle stuff. Hence the name. Anything that has to do with layout, drawing and so on, that is anything that has to do with how your data set is presented, is delegated to pluggable classes. That makes the new RecyclerView API extremely flexible. You want another layout? Plug in another LayoutManager. You want different animations? Plug in anItemAnimator. And so on. In the next paragraphs I will briefly describe what each class or interface is about and how RecyclerViewuses it. In future posts I will revisit some of these classes, write about them in detail and show you how to customize them for your project’s needs. It’s a bit weird that Google waited so long to enforce the usage of the ViewHolder pattern, but better late than never. If you do not know about the ViewHolder pattern, have a look at this Android training session. It uses the old Adapter, but the pattern itself hasn’t changed. Also searching for ViewHolder should yield plenty of hits to further blog posts. For example this post byAntoine Merle about ListView optimizations. One thing that is specific to any RecyclerView.ViewHolder subclass is that you can always access the root view of your ViewHolder by accessing the public member itemView. So there’s no need to store that within your ViewHolder subclass. For the new RecyclerView Google has decided to replace the old Adapter interface with a newRecyclerView.Adapter base class. So say good bye to things like SimpleCursorAdapter, ArrayAdapter and the like. At least in their current incarnation. Currently there is no default implementation of RecyclerView.Adapter available. Google might add some later on, but I wouldn’t bet on this. For Animations to work properly, cursors and arrays aren’t the best fit, so porting the current Adapter implementations might not make too much sense. That’s very weird! Why not make it abstract right away? Anyway: Better you override this one to be on the safe side for when Google releases the final version of L.
But only overriding those two methods won’t get you very far. After all the LayoutManager is responsible for positioning the items you want to display. Thus you have to override onLayoutChildren() as well. This method also contains a log statement stating “You must override onLayoutChildren(Recycler recycler, State state)”. Ok, then make it abstract Luckily there’s still plenty (?) of time to change that into a proper abstract method for the final release of L. We all make mistakes. After all, my “Stupid stuff devs make” series is all about blunders that I made. So don’t get me wrong. No hard feelings here! Surprisingly these methods are not part of the source code in the SDK folder, but you can use them as they are part of the binaries. As I cannot imagine those being removed, I’m sure you’ll find these in the final L release as well. Since I’m going to write an extra post about LayoutManagers this should suffice for now. You do not have to use an ItemDecoration. If, for example, you use a CardView for each item, there’s no need for an ItemDecoration. The LayoutManager calls the getItemOffset() method during the measurement phase to calculate the correct size of each item’s views. The outRect parameter might look a bit odd at first. Why not use a return value instead? But it really makes a lot of sense, since this allows RecyclerView to reuse one Rect object for all children and thus save resources. Not necessarily nice — but efficient. One thing I didn’t expect considering the name of the class is that the onDraw()/onDrawOver() methods arenot called for each item, but just once for every draw operation of the RecyclerView. You have to iterate over all child views of the RecyclerView yourself. Obviously for animations to work, Android needs to know about changes to the dataset. For this Android needs the support of your adapter. In earlier versions of Android you would call notifyDataSetChanged()whenever changes occured, this is no longer appropriate. This method triggers a complete redraw of all (visible) children at once without any animation. To see animations you have to use more specific methods. RecyclerView also offers some rather generic listeners. Once again you can safely forget everything you used to use up to now. There is no OnItemClickListener or OnItemLongClickListener. But you can use anRecyclerView.OnItemTouchListener in combination with gesture detection to identify those events. A bit more work and more code to achieve the same result. I still hope for Google to add those Listeners in the final release. But whether those Listeners will be added is as an open question. As you can see, nothing special here. You do not define the orientation or stuff like that on theRecyclerView. Actually RecyclerView itself makes no use of the attributes, it passes them on to the parent (which is ViewGroup) and that’s it. Now of course this is misleading. That’s only the glue code. The really interesting stuff is in RecyclerView'smany inner classes which you can subclass and tweak to your needs. That’s where the real work is done. But the separation of concerns Google created helps you stick to one task within one implementation and it should make reuse easier to achieve. That’s why I like RecyclerView and its ecosystem. I’m not afraid to criticize big G, but that’s well done, Google! So we can expect more LayoutManagers. Which, of course, is good. Furthermore I expect at least one default ItemDecoration as well. After all the support library’s sample project contains aDividerItemDecoration, which works well with the LinearLayoutManager. I’m more skeptical about adapters. While an ArrayAdapter (or better yet, ListAdapter) is very well possible, I am more doubtful about a CursorAdapter since cursors do not lend themself easily to the new addition and removal notifications within the Adapter. I strongly recommend to have a look at Lucas Rocha’s TwoWayView project. He has updated his project to work with RecyclerView and has done a great deal to make using RecyclerView a lot easier. For many use cases the default layouts he provides should suffice. And he also provides support for customLayoutManagers. Which are simpler to write using his framework than with the base RecyclerView. Take a look at his project and check out if it covers all you need. Using it helps you get rid of some ofRecyclerView‘s complexity. Frequently we do our work from two different computers, for example at work and at home. You will get this error and ask you to re install your app. Even cancel the negative tax, prices still will not fall, but will not collapse. Some foam excessively high price adjustment will be uncompleted, but will not be cheaper than the surrounding second-hand house prices, if the opening price of the new building is cheaper than the surrounding second homes, this is a signal that prices will fall. The following discussion only investment house, regardless of the ups and downs have no effect on the housing market since. 1- real estate, especially second-hand housing prices, unlike the stock price will be controlled by large consortia large organizations, real estate is dispersed in private capital, the landlord owns the property pricing. 2- real estate investment, as long as the rent can be roughly the loan interest, the landlord can be long-term holders, can not be lower than the purchase price to sell. 3- Even empty rent, as long as the landlord still have other income to support the loan interest, the landlord still does not sell cheap. 4- If you hold multiple sets of investment property, rent can not afford to have, there is no other source of funds, must sell, which is the worst landlord sold the original price. 6- to give the house a bank loan valuation, is to prevent the occurrence of article 5, outrageous prices banks are refusing loans, as long as the bank can lend to you, it means the bank on the housing market still has confidence. 1- investment banks to tighten housing loans, investment house rent is no longer included in your repayment ability, do not refinance. 2- rental market is bleak, the rent does not go out a lot of investment, hold the landlord could not be sold at or returned to the bank, the bank will come up with a large number of defaults on real estate market auction. 3- large number of houses on the market, buyers are free to choose to bargain shop around, intermediaries like obstinacy when the buyer when God. 4- fewer buyers, landlords or sell price, no one wanted to buy the dips, because the unemployment rate surge, people have fled the city, why not have jobs to buy a house, like Perth, Western Australia, has Today million mansion now playing on the break, but you will buy it, hundreds of thousands to buy a mansion ghost town, light long grass prices, no one to rent. 5- company going bankrupt, banks insurance company closures, staff turnover serious, become Sodom, like Detroit did, house not money, who accounted for is who you go to Detroit it? Everyone hold out hope that the decline in value immediately pick up a leak, how this market could crash it. Government intervention useless, heavenly government so the concentration of power, plus the purchase of real estate tax is still weighed less than the price, not to mention the Australian government, the abolition of negative gearing count root feather ah. When housing prices began to fall, is the social collapse, when prices plummeted more will buy more, if one million fell 800,000 you buy it, and then fell to 600 000 to buy a case of it? House only buy or not to buy, there is a small part of the landlord to give you a specific reason prices pick up a leak, can hold live Why not bad money to give you Jianlou depreciation, gains this year to sell well on hold until next year, or the year after sell short wait for the next wave of market and then sell. So now do not guess prices up or down, to analyze the financial, employment status, social status, political changes, if the deterioration of the economic downturn, rising unemployment, in such a place even have enough to eat, and prices fell another what significance does it. Sydney, Australia, the country is now the case is affected by the relative economic slump, but some areas still good mix of tens of thousands of annual salary, look around friends are unemployed are facing layoffs, and many government policies are trying to save the economy in decline, want to reverse as soon as possible, so that the Australian out of the woods, the community did not despair, real estate naturally confident. For an ArrayAdapter, notifyDataSetChanged only works if you use the add(), insert(), remove(), and clear() on the Adapter. When an ArrayAdapter is constructed, it holds the reference for the List that was passed in. If you were to pass in a List that was a member of an Activity, and change that Activity member later, the ArrayAdapter is still holding a reference to the original List. The Adapter does not know you changed the List in the Activity. Create your own class derived from BaseAdapter and ListAdapter that allows changing of the underlying List data structure. Use the notifyDataSetChanged() every time the list is updated. To call it on the UI-Thread, use the runOnUiThread() of Activity. Then, notifyDataSetChanged() will work.